DUCK A LA TABLA | Jane Lear. Writing on Food and Travel. I’m pigged out, which is not the same as pigging out. I’m bored with beef. I do not want to see any more turkey for a while, although a fragrant bowl of homemade turkey stock, thick with orzo or tiny pasta stars, does not count. A juicy roast chicken will always have its place, but still. What I crave is duck. I could eat platefuls of that rosy, tender deep-flavored meat under its mantle of wonderfully crisp, golden brown skin. You have no idea how far I’ve come. Don’t get me wrong. I grew up with feathered game on the table. Dove. Quail. Pheasant. Partridge. And duck. I ate it all with gusto, as well as with the abnormally gentle, mindful-of-shot chewing technique that you will see in anyone who was raised on game birds that are not farmed. But although I’ll happily roast a pheasant (worth it for the stock alone) or a brace of quail, it would never occur to me to cook a whole duck at home. For starters, there’s all that rendered fat that needs to be constantly remove from the roasting pan, in case of fire. Fire, for god’s sake! And because a duck is heavier-boned than a chicken, for instance, there is never as much meat as I expect. But a duck breast (actually a breast half, if you want to be anatomically correct), now, that’s a different story. It’s much easier to cook than a whole bird, and there is practically no waste. The solid slab of meat usually ranges from about ¾ to 1¼ pounds, and a larger one feeds two people easily. I like to cut any leftovers into slivers and fold them into warmed flour tortillas with scallions, cucumber, and hoisin sauce for makeshift Peking duck. Duck, sans skin, is leaner than chicken or turkey, yet still manages to be luxurious in its own way. What that means is that you don’t need to fuss over the sides. Acorn squash, cut into quarter moons and roasted is delicious with duck, as are grits or mashed potatoes. Polenta is good, too. Something green adds brightness and balance—an endive and chicory salad, say, or braised Savoy cabbage or little green lentils, simmered until just tender. My favorite way of cooking duck breast comes from Floyd Cardoz, chef-owner at Tabla, an Indian fusion restaurant here in New York City that recently closed its doors. I was fortunate enough to work on a cookbook with him, and the project was more than great fun, it was a master class with one of the most extraordinary chefs in the business. Floyd knows how to coax intricate, mysterious flavors out of a simple combination of spices and other ingredients, and what anchors it all is flawless French technique, which, as you will see, is not code for difficult. The duck breast is cooked on top of the stove and fat side down—it’s not turned over at any point, although I did for the photo, above, to show you how crisp the skin gets. 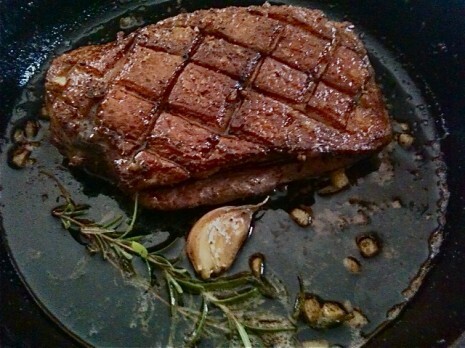 The meat becomes even more succulent because it’s basted toward the end of cooking. In the French manner, Floyd always adds butter to the fat in the pan to give the basting sauce more roundness, but I’ve stopped messing with a good thing: Duck fat is higher in monounsaturated fat and lower in polyunsaturated fat than chicken or turkey fat. It’s also stable, unlike many vegetable oils; it doesn’t turn rancid as fast, and when heated, it doesn’t break down as easily, which is why it is prized for frying potatoes. I refrigerate my leftover duck fat in a tightly sealed jar, and every time I look at it, I think about what a nice emotion anticipation is. Note: The quantities of spices called for below are enough for three duck breasts, which will feed six. Because the combination of black peppercorns, star anise, and allspice is so adaptable (and also because a spice grinder won’t grind a smaller amount properly), I always grind the full amount and save what remains to mix into burgers or hummus. Grind the peppercorns, star anise, and allspice in an electric coffee/spice grinder until medium-fine. Put the ground spices in a bowl and stir in ½ tablespoon salt. Leaving the skin side of the duck breast alone, trim any excess fat from sides. Then score the skin side in a crosshatch pattern, cutting through the fat almost to the flesh so that the fat renders more easily. Return some of the rendered fat to the skillet and add the butter (if desired), garlic, rosemary, and ginger. Increase the heat to moderately high and start to baste the duck with a spoon, pulling the skillet off the heat briefly and tilting it so that the fat is easy to spoon up and over the meat. Baste frequently for 5 to 7 minutes. Transfer the duck to a cutting board and let it collect itself for 10 minutes. Thinly slice it across the grain to serve. *I tend to buy Moulard duck breasts from D’Artagnan or Muscovy duck breasts from Grimaud Farms because they are easy to find in Manhattan. Both are large, meaty, and possess deep, almost minerally, duck flavor. If you prefer something milder, try Pekin duck breasts from Maple Leaf Farms, which are widely available at supermarkets. A Pekin duck, by the way, is not the same as a Peking duck. Pekin (a.k.a. White Pekin or Long Island duckling) is a breed of duck that originated in China; one center of production in the United States was, yep, Long Island, New York. “Peking” is a Chinese style of cooking duck, any duck. January 18—just missed it!—is National Peking Duck Day. Posted: January 19th, 2011 under cookbooks, cooking, food, people + places, restaurants, winter. Hi, This sounded so good that my friend is making it for us for dinner tonight. We are bringing the wine. Hubby was going to bring a syrah but after seeing the seasoning thinks a Gewürztraminer or Riesling- what do you think?Can’t wait! We actually drank a Syrah—one from Bonnie Doon, I think—with our duck because we had a bottle already open. And it was absolutely delicious!